Wilmington, N.C. ABC affiliate WWAY-TV has installed a trackless virtual studio solution from Vizrt. The station has eliminated its hard set and revamped its control room, as well as upgrading to robotic cameras in the studio. By using Viz Virtual Studio and Vizrt’s TV in a Box solution, an entire newscast can be controlled by a single operator. 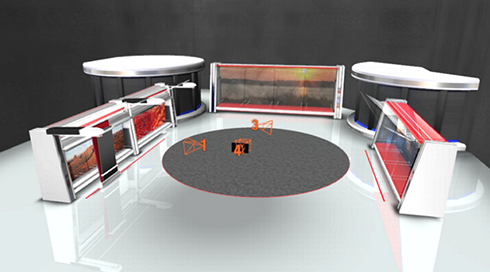 One of the WWAY-TV virtual sets as it appears on air. The studio includes for fixed robotic cameras that shoots talent against a green screen background. The Vizrt software inserts the virtual set and allows the station to select from unique looks for news, sports and weather. The system also allows live video feeds to be inserted into the virtual monitors found on the virtual set as well as allows for smooth camera movements. A 3D model that shows camera positions. 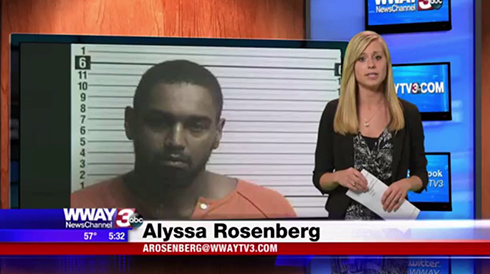 WWAY-TV’s sister station, WXXV-TV, the Fox affiliate in Gulfport, Miss., also uses a similar system. The station’s owner, Morris Network, is also investigating implementing the system at other properties it owns.